Choose a life stage and we’ll show you our most popular hospital & extras cover combinations for people like you. Hospital cover for a few common services, combined with Extras cover for 7 services including General Dental, Optical, Physio and more. Hospital cover for a range of services, combined with flexible Extras cover for General Dental and Urgent Ambulance plus 2 more services of your choice. Top Hospital cover including maternity, combined with flexible Extras cover for General Dental and Urgent Ambulance plus 2 more of your choice. Top Hospital cover including private maternity, combined with flexible Extras cover for 10 services of your choice that you can swap at any time. Hospital cover for a range of services, combined with Extras cover for 19 common services including General Dental, Optical and Physio. Hospital cover for a wide range of services, combined with Extras cover for 19 common services including General Dental, Optical and Physio. Basic Hospital and Medical cover suitable for visitors to Australia, combined with Extras cover for 7 common services including General Dental. Hospital and Medical cover suitable for 457 and most other working visas, combined with Extras cover for 19 common services. Members are at the heart of everything we do. When we make decisions, we will always put our members’ needs first. We’re a not-for-profit health fund. With no shareholders to pay, we can focus on giving more back to our members. Claim online and check your limits and usage through myHBF and the HBF Health app. HBF has delivered the lowest average increase in premiums of all major Australian health funds, with HBF premiums rising by an average 1.94% from 1 April 2019. The average increase is the fund’s lowest in more than 15 years, and it has been delivered against a 4.4% increase in benefits for the average HBF member last financial year. 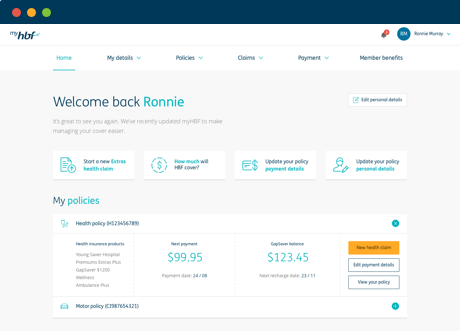 Make a health claim, update your personal or payment details, view your extras limits and usage and more in myHBF. It's never been easier to manage your policies in the one place. 1Basic Hospital Plus $750 excess single cover, paid monthly by direct debit. T&C’s apply.